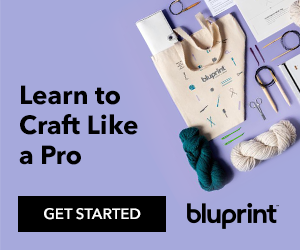 Free pattern to stitch my One World One Heart giveaway design. Do not forget to stitch the spider web roses and leaves on the front. Tutorial for the oblong pillow can be found here on my tutorial blog . Here it is in blue and pink. The winners of my Valentine giveaway and my friends birthday gift. Hi everyone, I would like to apologise for the delay in posting the winners, late last night I was preparing to post the names and then I realised I had made a silly mistake, I had put in the post that the date of the drawing would be the 19th February and just at the last minute I noticed I had put 20th February on the photograph! Aghhh!! So I had to change the posting date to today, however, I did not specify a time on the photograph and therefore I have decided to post the results now. I have not recieved anymore comments since last night but I thought I had better stick to the rules and wait until today to post the winners. I would like to thank all of you for your wonderful comments on my Valentine giveaway, I really appreciated every single one of them, unfortunately not everyone can win, but I have added two more bottle cap pincushions, making a total of four prizes. Please do not be too disappointed if you do not win, I have never won a giveaway yet, although I do keep trying! lol I think the reason why I keep trying is because I think that one day I just might win a giveaway! Ladies please could you leave a comment with your email address and I shall contact you. I have not forgotten about the pattern for the oblong pillow for the One World One Heart giveaway, I shall be posting that in my next post. I am just putting together the instructions for the heart shaped valentine pillow and I will be showing step by step instructions on my tutorial blog here . Here is the One World One Heart set made up in pnk, I decided to make this as a birthday gift for my friend Angela. The oblong pillow pattern will be available in my next post. charms. I found the ones I used from Thread Bear here in the UK. I attached this charm using my favourite stitch - blanket stitch. Thankyou all again for your lovely comments, it has been a pleasure to read them all. Hi everyone, I have made a copy of the Valentine giveaway for myself and decided to make this little bag to store my Valentine smalls in, the inspiration for this bag came from Martha Stewart's website here I did alter the design and finish but at least you can see the basic tutorial. There is still time to enter my Valentine giveaway here open until 19 February. The winner of the One World One Heart giveaway is????? Hi everyone, the time has come to announce my One World One Heart giveaway winner, I would like to thank everyone who visited my blog and left a comment , I appreciated every single one of them. Now for the moment you have all been waiting for, drumroll please! !!!!!!!!!!! Congratulations, you have won all of the items in the photo! 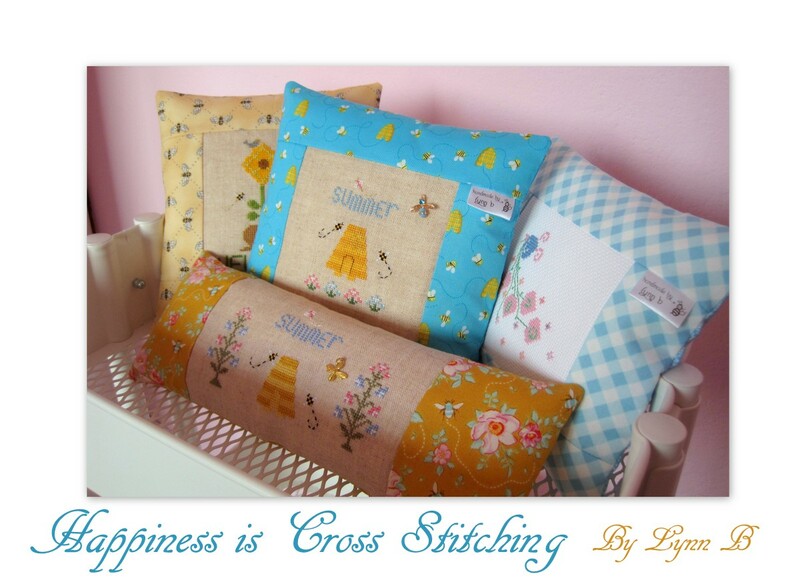 I did receive a couple of questions about my stitching, one lady wanted to know what I filled my little pillows with. I use polyester filling in all of my pillows. The pattern for the oblong pillow in the photo above is now available here , the instructions will be available later. Thankyou for all of your lovely comments, it was a pleasure meeting new friends and catching up with some of my old friends too! I designed the box myself, it is trimmed with Swarovski crystals and handmade cord using DMC thread 825. You can visit Glady's blog here. Instructions showing how to make this biscornu can be found on my finishing tutorials blog here. I am so pleased that Glady's liked the exchange I made! My Valentine giveaway and exchange received from my friend. Hi everyone, I have received my exchange from my friend in Spain ( photo's below) and I am also offering another giveaway! This giveaway is now closed. Another giveaway you may ask? Well, last year I missed out on offering a Valentine giveaway and I did not want to miss out again this year, so here it is! 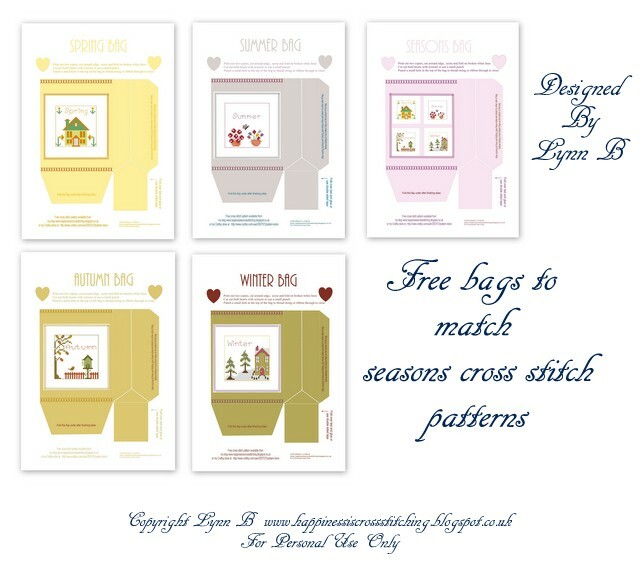 I just love stitching red and white, particularly hearts and roses, so I decided to design this small collection for two lucky people to win, I do hope you like them. I am hoping to put together the instructions for this design when I get a moment. Please scroll to bottom of post to see how to enter. The first prize is the heart shaped felt pillow and the bottlecap pincushion embroidered with spider web roses and finished in blanket stitch. 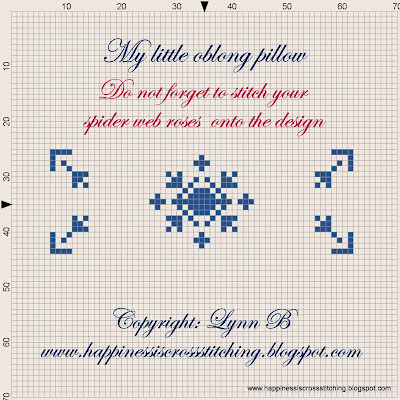 The second prize is the square pillow embroidered with spider web roses and hearts, also finished in blanket stitch. All you have to do is leave a comment on this post before 6pm (GMT) on Friday 19th February. If you already follow my blog you are automatically entered, if you decide to follow my blog I will enter your name into the draw again. Here is the lovely exchange gift I received from Glady's in Spain. I received this in the mail on Saturday morning, it was a lovely start to the weekend! Glady's made me this lovely pillow,trimmed in this lovely edging and backed with my favourite type of fabric. Glady's also included threads, fabric, Valentine buttons and the most beautiful rose decorated thread holders. The design is from the Joyeaux Noel book from Blackbird Designs, stitched on 32 count linen using Crescent Colours thread - Wild Berries. Thankyou so much Glady's for this lovely exchange, I shall place the pillow in a safe place where I can see it everyday! You can see Glady's blog here. Thankyou for all of the lovely comments you leave on my blog, they are always a pleasure to read. Hi everyone, firstly I would like to say thankyou for all of the wonderful comments I received on my One World One Heart Giveaway in the previous post, (over 200!) I was thrilled with the interest you all showed in my new projects! I would also like to welcome all of my new followers, I hope you enjoy stopping by my blog and I look forward to making your visits worthwhile in the future. 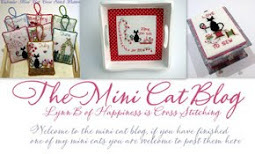 Don't forget to stop by my stitching tutorials blog here where I will show how I finish my projects. 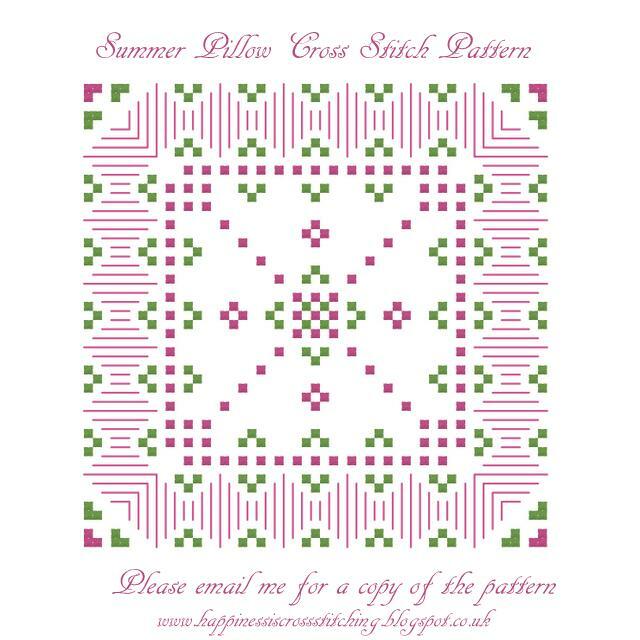 As a thankyou to you all I have designed another free pattern, this is for the little pillow from the box set I made here if you wish to receive a copy please email me. I have just sent a personal exchange to a friend in Spain, it should arrive at it's destination in a day or two, I am looking forward to showing you what I have made, and of course I am eagerly awaiting the delivery of my exchange from Glady's! 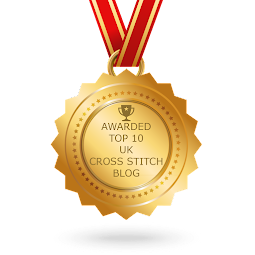 I am also stitching the blog giveaway for myself and I will be putting the cross stitch grid on my blog as a freebie, I will then show how to make the little pillow and the tuffett pin cushion on my finishing blog over the next few weeks, so if you are disappointed not to win and you really love it, you could always stitch it for yourself! My blog giveaway is still open here until 15 February. I am also hoping to put together a Valentine giveaway on the 14 February, of course there will be plenty of love hearts incorporated into the design! Will it be a bag? A pinkeep? A pillow? A box? Mmmmm I think I will have to keep you guessing on that one as I have not decided myself yet!